2017, at least so far, is looking to be the year of the Japanese game. Starting off with a bang was Resident Evil 7: Biohazard, taking fans back to the roots of survival horror. In February we were struck with Nioh, which was basically if Ninja Gaiden and the Souls games had a kid, but on steroids. March saw the release of the fastest-selling Nintendo console ever, the Nintendo Switch, shipping 2.4 million units in its first month. Released alongside the Switch was The Legend of Zelda: Breath of the Wild, which is now often cited as the reason why the Switch sold so many units. With it having a score of 97 on Metacritic, along with perfect reviews, it’s quite easy to see why. Only a week or so later, people were then exposed to the dark horse that is NieR: Automata, a game that many were already considering to be game of the year. With both Zelda and NieR leading the charge, it seemed as if the game of the year title, for/from Japan anyway, had already been decided. However, people seemed to have forgotten about a little game from Atlus that was peeking its head across the horizon, ever so slowly towards its release date. That game is Persona 5. Taking place in 20XX (presumably 2016) Tokyo, Persona 5 tells the story of you, the protagonist, and your adventure as the leader of the Phantom Thieves. The Phantom Thieves are a group of troubled teenagers who, by day, are your everyday high school students, but by night change the hearts of corrupt and evil individuals by using their Persona, the literal materialization of their inner psyche. While this is happening, however, mysterious mental breakdowns begin to occur to high-profile people, and the blame gets directed towards the Phantom Thieves. Can they absolve themselves of the blame and help bring justice to the world? The story is beyond insane and incredible, with a lot of key moments where I was on the edge of my seat, waiting to see what happened next. 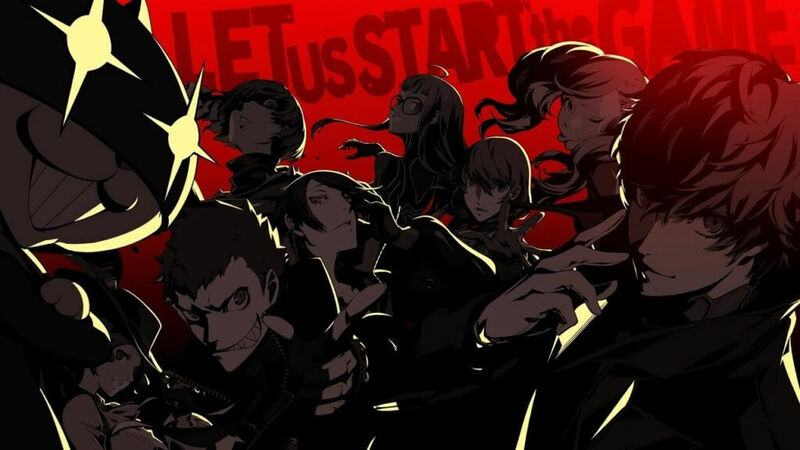 Like with Persona 4/Golden, there is a bigger mystery that you need to solve as the game progresses, and as you play you start to see everything slowly come together and connect. The writing team has clearly poured their heart and soul into the story and characters, and you’ll catch on quite quickly to who your favourites are and who you should keep an eye out for. 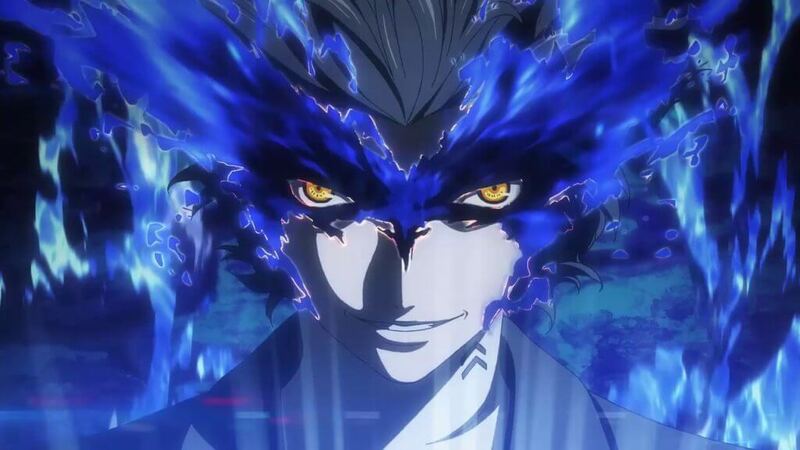 Persona 5 tackles some hard-hitting topics, and you will feel every emotion displayed by the characters, whether it is the more light-hearted, comedic moments where you will laugh with them, or the more serious parts where you’ll connect with their anger or sadness. The game also keeps you on your toes as to who the real culprits are, so it’s best to choose your decisions carefully, as you never know what might happen next. 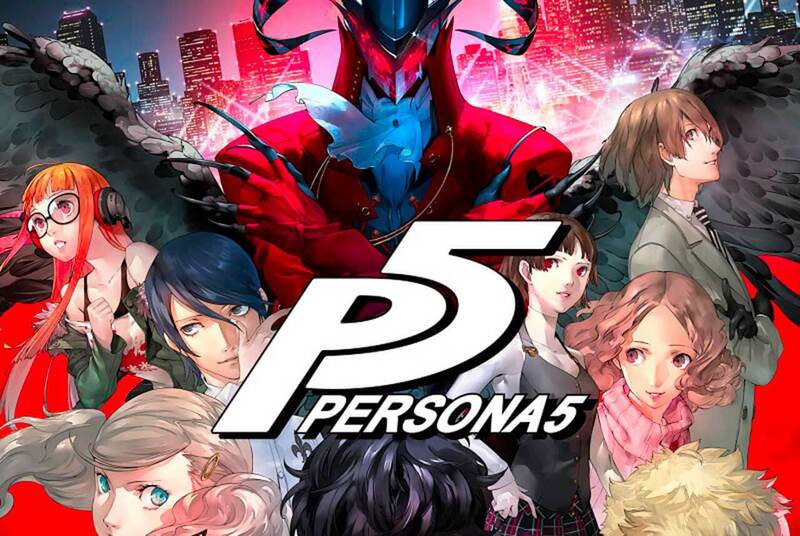 Persona 5 is one part turn-based JRPG (think Pokémon), one part dungeon crawler, one part visual novel and one part social simulator, so there is something in it for everyone. One of the best aspects about the game is that you don’t have to have played the previous entries in the series; Persona 5 stands on its own, so you don’t have to worry about playing the others to understand what is happening. Like with previous entries in the Persona series, the game takes place over the course of one year, where you decide what to do day by day. Maybe you want to grind some XP and/or complete some side missions in Mementos, an ever-changing randomly generated mega dungeon? Or, maybe you want to work a part-time job to earn more cash, which can be used to upgrade your gear and buy healing items? Read a book, study, watch a movie or hit the batting cages to upgrade your social stats and spend time with your companions? 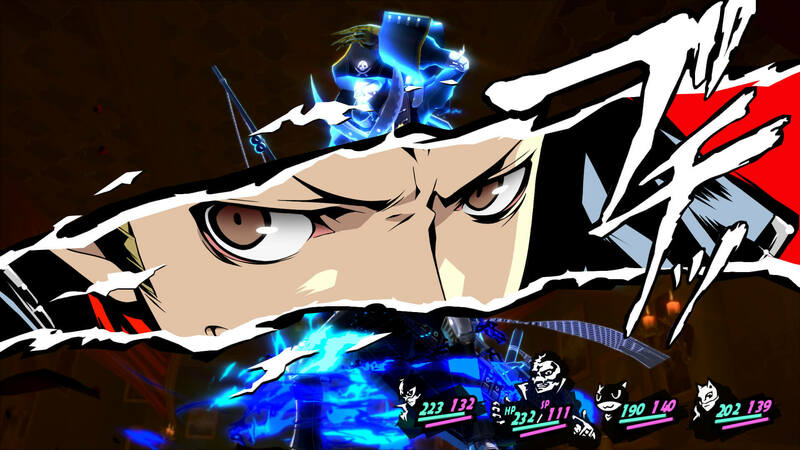 Persona 5 has a huge open world for you to explore, and a wide variety of activities to make your character stronger, though just be sure to watch out for the time limit. When your key story missions start, you only have a set number of days to change the heart of your target, so it’s best to plan what you would like to do in advance so you don’t accidentally run out of days, which can lead to a game over. Using up to a party of four, you can explore the vast main dungeons, called ‘Palaces’, which change depending on who you’re targeting. Once you’re ready to complete your main objectives, you’ll head over to your targets palace to make an infiltration route, send the calling card, steal their treasure and stop the enemy. Some locations include a huge castle, a big bank, and a space station. Each Palace has its own set of puzzles to solve and monsters, called ‘shadows’, to fight. Fights are very similar to Pokémon battles, where each Persona has its strengths and weaknesses to attributes and stats. It’s best to work with your party to find out your enemies weaknesses and hit them hard, hopefully so you can get a ‘hold-up’ where you can force your enemies to drop items/money/have them become part of your line-up, or use an ‘all-out attack’ to deal huge amounts of damage, normally enough to finish them off. 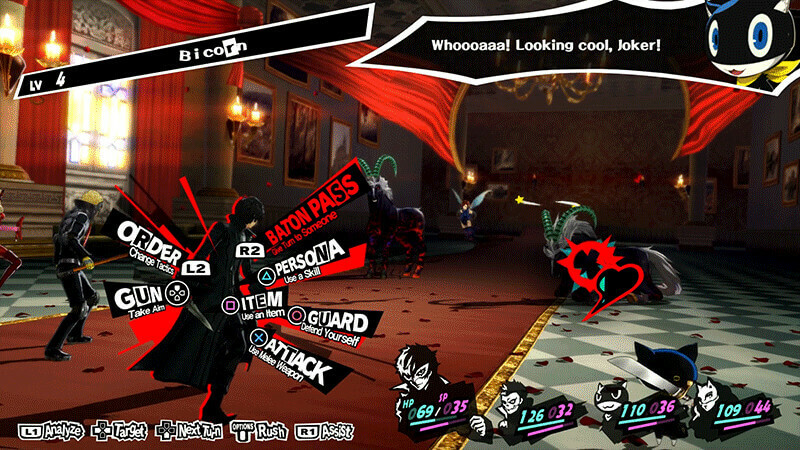 Atlus has created a visual delight with Persona 5. Whether it’s the small things like mood lighting, cherry blossoms, leaves traveling on the wind and the amount of life in the world, or the more ‘in your face’ type visuals like the huge sprawling Palaces, transformation scenes, all the different kinds of Persona and the city-nightlife, Persona 5 is a world that invites you to participate. Production I.G created the animated scenes for the game, and once again got to flex their muscles with them. The scenes are well-done and make you wish that there was more to watch, whether it be a fun outing to the beach or a grand scale police pursuit. I’m seriously hoping for I.G to get the green-light for an anime, just like with Persona 4 and Persona 4 Golden. Making the visuals even more appealing is the rocking acid jazz soundtrack, once again produced by Shoji Meguro (of course). So far my favourite has to be “Layer Cake”, the song that plays while you buy and modify powerful weapons at the Airsoft Shop. It’s one of those songs that gets you pumped and ready to kick some arse. Some other notable tracks include the games OP, “Wake up, Get Up, Get Out There”, which also gets you pumped to jump straight into the action, “Life Will Change”, which is played during the final stretch of a Palace, and “Last Surprise”, your main battle theme. Persona 5 has a whopping 110 tracks, which are all available to buy on iTunes worldwide. However, after all of this praising, I do have some small digs to make about the game, mainly in comparison with Persona 4 Golden. My first problem is with the dungeons. Even though they’re the best ones in the series so far, only the ever expanding Mementos is re-playable. In Persona 4 Golden, however, a majority of the dungeons are re-playable, where you can grind and/or collect low level Personas that you might need later on to make some of the strongest Personas in the game (e.g. Trumpeter). Another issue I have is that you can no longer buy skill cards to teach your Persona new abilities, a feature which was added in Persona 4 Golden. This was a major way to use any Persona you wanted without having any real consequences, and a way to mix your team up (like how you would use TMs in Pokémon). My last problem is that the DLC is somewhat overpriced, at least where I am in Australia. $10.45 for some costumes, accessories and a BGM track is a bit much. The same goes for the DLC Persona from previous games; $4.55 for a super under-level Persona and a re-colour as an extra is, again, a bit overpriced. Although, I will admit, there are quite a few games that are a lot worse off when it comes to DLC. Don’t bring a knife to a Persona fight. In all honesty, though, Persona 5 is a really difficult game to make negative points about unless you’re truly nitpicking. Sure, I could list some ideas to make the game better, like what I mentioned above, but nothing particularly stands out as an issue. The frame rate is flawless (albeit at 30fps on PS4 and the PSPro), while the gameplay is addictive and invites you to replay it again and again. The visuals are breathtaking and the soundtrack is rocking, led once again by Shoji Meguro. Persona 5 will keep you on the edge of your seat, and you will struggle to put the controller down to go back to your day to day life. It’s seriously that addicting. It’s not hard to see why so many people are calling it one of the greatest RPGs of all time. If you’ve never played a Persona game before, or even if you have, then I heavily advise that you pick this one up. After 97 hours, it’s safe to say that this is one of the greatest games I have ever played in my entire life. Persona 5 is available on both the PS3 and PS4 via the PlayStation Store digitally and from most retail outlets around the world. While you’re at it, you can grab the game’s DLC from the PlayStation Store, which includes some item starting packs for free, as well as costumes and Personas from other games, avatars, and themes. Check out the Persona 5 website, and check out Atlus and Deep Silver over on Twitter to keep up to date with everything Persona. What are your thoughts on the game? Do you agree or disagree with my review? Let me know in the comments below! Yatta-Tachi's (unfortunate) voice down-under. Ironic lolicon, avid player of games and anime and the LoL play-by-play caster, main host and one of the organisers for AGFA eSports LoL and the South Australian high school club series. If you'd like to know more about my League career, or AGFA eSports LoL in general, anything else about me or just have a chat, hit me up on Twitter @TheBazza59!